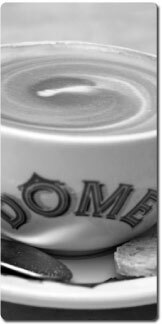 DÔME Café originates from Perth, Western Australia. The founders envisioned and actualised a dining experience with quality service, speciality food and most importantly, the world’s finest coffees. We are well renowned for our coffees, which are made from 100% Arabica beans that are selected and roasted to perfection by our master roaster. They are intensely flavoured and aromatic and have been critically acclaimed as the world’s finest. To accompany our selection of coffees, our menu also comprises of gourmet foods and cakes. The Melium Group introduced DÔME Café to Malaysians in 1995. This new classic style elevated café dining with an ambience suited for a diversity of lifestyles. With an increasing number of outlets blossoming around Malaysia, DÔME Café continuously envisions to provide Malaysians convenience and accessibility to our coffees and food.